During the day, my work at the DC Primary Care Association focuses on broad health policy issues, system change regarding health care financing, workforce, meaningful use etc. However, like the friend I lost in 2005 before his 25th birthday to a rare non-Hodgkins lymphoma, there are many people out there who cannot afford to wait for the system to change. I started the MarbleRoad Blog in 2009 to talk about three things of importance to me: national service and volunteerism, community health centers, and rare diseases. The blog quickly grew into something I had never imagined. In just a little over a year, the blog now has syndication on The Childrens Rare Disease Network, and the original site has welcomed thousands of visitors from around the world. Many have stopped to share their stories with me, about their struggle to find a doctor who had challenges with appropriately diagnosing their condition, or difficulty accessing treatment for an ultrarare disorder, or about their child passing away before their 10th birthday without ever even being offered a diagnosis, etc. I felt like there was so much more I could offer these families. Approximately 7,000 rare diseases affect more than 30 million Americans, 75% of which (22.5 million) are children. The nations community health centers offer primary care services to more than 20 million of our most medically underserved, largely the uninsured and underinsured – at over 1200 service sites throughout the country. Combine these two groups of people and you have millions of extremely vulnerable families who find themselves in extraordinarily difficult situations. As a result, I founded MarbleRoad in 2010 to connect these people, people who have extremely complex illnesses, with the resources they need to help them improve their lives. However, financial assistance from MarbleRoad will not be just a handout. 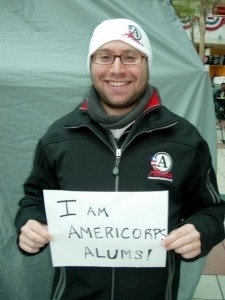 As an AmeriCorps Alum, I believe in the spirit of volunteerism, that anyone can serve. After college I completed two full terms of service (totaling 3400 hours of service) with Community HealthCorps, an AmeriCorps program managed by the National Association of Community Health Centers. MarbleRoad will include a volunteer service requirement as a part of the eligibility for financial assistance. In this way our financial assistance to individuals and families also leverages additional community impact. MarbleRoad is celebrating its launch with its first ever fundraiser: a silent art auction in October on the 20th Anniversary of Make a Difference Day. On that day, I will also be asking my guests to make a commitment to serve and volunteer in their own communities, to sponsor, in a sense, a recipient of financial assistance from MarbleRoad. For information about purchasing to tickets to the event please visit http://bit.ly/aPc4uz. If you cannot attend, there is an option to donate any amount. For more information about our organization please visit http://www.marbleroad.org.